Botswana (officially called Republic of Botswana) is a country in southern Africa. The capital of Botswana is Gaborone. 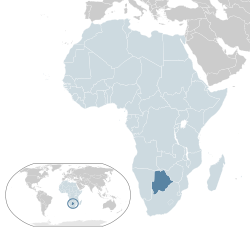 Botswana is bordered by the countries of Zimbabwe, South Africa and Namibia. It is also possible to travel from Botswana directly into Zambia by crossing the Zambezi river by ferry. Botswana has no coast on the sea, nor on a lake. This type of country is called landlocked, and means that all of Botswana's trade must be brought in over land, or by aeroplane. People from Botswana are called Batswana. The population of Botswana is about 1.8 million people. This is a small number for a country of this size, and so the population density of Botswana is very low at only 2.7 persons per km². This is because most of the country is desert and very dry. The languages spoken by most Batswana are English and the local language called Setswana (also called Tswana). Botswana is a democracy and the people vote for their political leaders, who vote for their president. The current president of Botswana is Ian Khama. Botswana's economy comes mostly from the mining of diamonds, as well as metals such as copper and of minerals such as salt. Many people come to Botswana each year to see its wildlife, and so tourism is important to the country. The currency of Botswana is called the Pula (which means rain). It is made up of 100 thebe (which means shield).One US $ is about 6.8 Pulas . ↑ Central Intelligence Agency (2009). "Botswana". The World Factbook. https://www.cia.gov/library/publications/the-world-factbook/geos/bc.html. Retrieved 3 February 2010. ↑ 2.0 2.1 2.2 2.3 "Botswana". International Monetary Fund. http://www.imf.org/external/pubs/ft/weo/2011/01/weodata/weorept.aspx?sy=2008&ey=2011&scsm=1&ssd=1&sort=country&ds=.&br=1&c=616&s=NGDPD%2CNGDPDPC%2CPPPGDP%2CPPPPC%2CLP&grp=0&a=&pr.x=36&pr.y=12. Retrieved 2011-04-21. ↑ "Distribution of family income – Gini index". The World Factbook. CIA. https://www.cia.gov/library/publications/the-world-factbook/fields/2172.html. Retrieved 2009-09-01. This page was last changed on 16 April 2014, at 01:22.